Gorgeous Riads in a Moroccan style situated inside the medina of Marrakech, just a few minutes walking distance from the Plaza Jamaa el Fnaa and also the Souks markets! Nice and warm and friendly staff! great location whilst nonetheless remaining some tranquility. Also gave very helpful directions so we could discover it- although the door is not clearly marked at all. 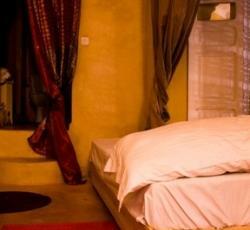 Friendly staff, clean and nice room, very good web signal in room, 5 mins from Jemma El-Fna. Relaxed atmosphere. Dogs && cat. Warm and friendly owners. Very great setting and a nice terrace. the rooms were also nice. * Riad Medina Azahara rated 4.56 out of 5 based on 9 customer reviews. Hostel reviews with a star rating are sourced from HostelBookers. If you find Riad Medina Azahara with the same booking conditions at a lower rate somewhere else on the internet after you have booked, we will refund you the total difference.